The airwaves of Stoke-on-Trent will have a brand new sound in January, as Internet-based 6 Towns Radio starts to broadcast on 87.7 FM. The community radio station starts to broadcast independently for a four week period on Monday 20th January 2014, until Sunday 16th February from its base in Queen Street, Burslem, Stoke-on-Trent. Deadline for all applications is: 5pm on Friday 24th January 2014. The Leek Arts Festival organisers want to know about your planned events a bit earlier than usual, for 2014. Programme content deadline: 31st January 2014. The Heritage Lottery’s Start-up grants scheme is seeking individuals who are… “thinking about creating a new organisation to engage people with heritage”. Applications can be submitted at any time, and grants of between £3,000 to £10,000 are available. * 15th January 2014: Increasing Sales to Grow the Business. * 29th January 2014: Spring Clean Your Marketing. * 19th February 2014: Powerful P.R. * 27th March 2014: Getting Started with Project Management. * “Making the Most of Donations and Gift Aid”, 16th January, 10am – 12 noon. * “Getting a Helping Hand with Volunteering and Give and Gain”, 20th February, 10am – 12 noon. * “Getting Involved in National Initiatives (Museums at Night, Takeover Day and Heritage Open Days)”, 13th March, 10am – 12 noon. The Stoke-on-Trent creatives behind the Blood and Bone China video series have a new horror music video online, Cardinal, “I’ll Be Damned”, directed by Chris Stone. Assistant Writers are needed for the Write On! Writing Squads across the West Midlands region. These voluntary roles will involve working alongside the Lead Writers at some of their Writing Squads for 8 to 16 year olds. The Assistants provide additional support; help with mentoring and providing advice and creative writing exercises for the children and young people taking part. They also shadow the Lead Writers to learn new skills with the opportunity for career development. Writing West Midlands is able to cover travel expenses. Deadline for applications: 1st February 2014. BBC Radio 3 is inviting applications for the 2014 edition of New Generation Thinkers. Specifically they want to hear from early-career university researchers… “with a focus on arts and humanities topics”. Successful applications will have the opportunity to develop radio programme ideas and to appear on air. They are especially keen to hear from people with an interest that encompasses biomedical and humanities. Full details at the Web page. You wait for years for some creative website neighbours, and then three come along at once! 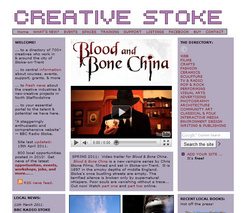 Say “hi!” to: Creative Walsall; Cannock Chase Creative Hub; and Lichfield Arts.